LIGHTWAVE ENDURANCE membranes were developed for cruising and offshore sailors who wanted the fastest and lightest sails, but with added long life and hard wearing capability. We've designed and built LIGHTWAVE ENDURANCE sails for a huge range of production yachts including Arcona, Bavaria, Beneteau, Dufour, First, Grand Soleil, Hallberg Rassy, Hanse, J Boats, Lagoon, Moody, Oyster, Swan and X Yachts. Our pricing structure is competitive and if your boat has an LOA of 25’ or above, you won't find a better performing or more durable sail on the market. Designed and engineered as a one piece composite Membrane with custom Yarn layouts on the inside of the laminate and durable taffetas on the outside. The yarns provide incredible strength and shape retention whilst the taffetas offer the highest level of protection against chafe, creasing, mildew and UV damage. 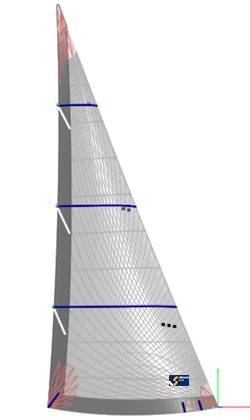 Loads imposed by a reefed or rolled sail are addressed by secondary yarn layers that blend in with the primary layers and extend the performance and structural life of the sail dramatically. 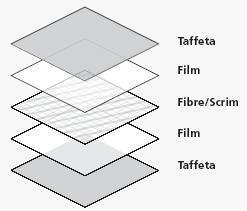 Superior lamination technology allows the concentration of yarns directly into the corner load points, making heavy corner reinforcements redundant and giving a soft finish for easy handling.